This one-pan dinner gives you juicy roasted chicken (with irresistible crispy skin!) and tender asparagus all on the same tray, and all drizzled with a tangy balsamic marinade. Bone-in chicken thighs would give every other chicken part a run for its money for a balance of flavor and affordability, and they’re much less fussy than breasts when it comes to cooking them. In this recipe, the marinade doubles as a sauce for the chicken and asparagus later in the recipe. 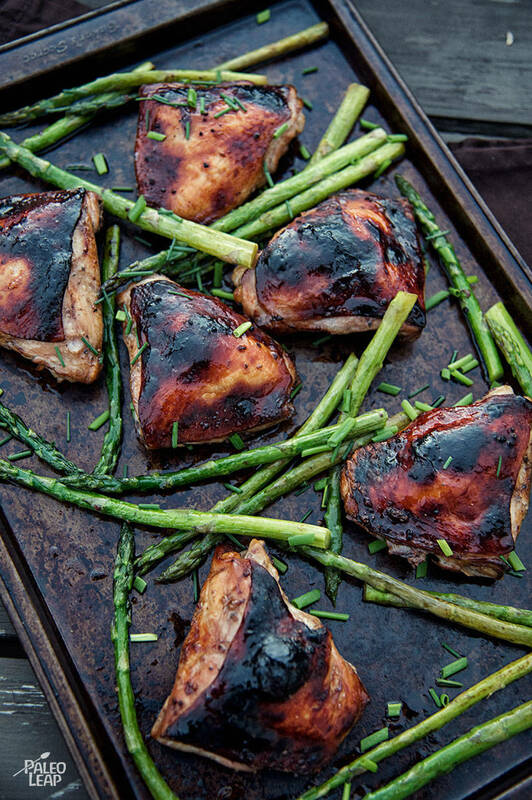 Yes, it’s true that the marinade touched the raw chicken, but after you put it on the chicken and asparagus, it all goes back in a 400-degree oven before it goes in your mouth. So it’s no riskier than recipes that have you cook the chicken right in the marinade – the reason for adding the marinade later is just to get optimal skin crispiness on the chicken. This recipe just so happens to be AIP-friendly as-is: with so much flavor from the balsamic, who needs extra spices? Unfortunately, asparagus is pretty high in FODMAPs but if you have a FODMAP sensitivity, you could always just substitute another vegetable or just make the chicken. It would also be great for leftovers – it’s easy to make extras, and you could chop the asparagus to make a chilled salad, with just a little bit of extra olive oil and balsamic on top as a dressing. SERVES: 4 PREP: 15 min. + 4h. COOK: 50 min. In a bowl, combine the balsamic vinegar, coconut aminos, parsley, garlic, olive oil, and salt and pepper to taste. Pour the balsamic mixture into a marinating container and add the chicken thighs. Marinate in the refrigerator at least 4 hours, or up to 12 hours. Remove the chicken thighs from the marinade and place on a baking pan, reserving the remaining marinade. Bake for 35 to 40 minutes, or until the chicken is cooked. Take the pan out of the oven. Leave the chicken in the pan, and add the asparagus. Drizzle the remaining marinade on top of the chicken and asparagus. Place the pan with the chicken and asparagus back in the oven and bake another 8 to 10 minutes. Sprinkle with fresh parsley to serve.